The Hopping Kangaroo proudly markets International flags, Country Flags, Historical flags, Novelty flags, Handwaver-Flags, Desk Flags. We are one of Australia's largest and most trusted supplier of flags - for every occassion. 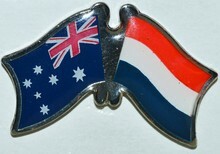 Flag Lapel Pins and Friendship Pins are our speciality. From every Nation- & Sub Nations such as Malaysia States, England, Scotland you name it we have it.The Hopping Kangaroo supply flags, lapel pins, desk flags and handwavers throughout Australia and Overseas. 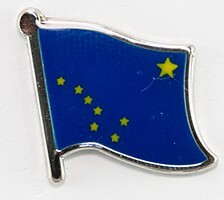 Flag Lapel Pins, Flag Badges off states from all around the world. Novelty Lapel Pins. Historical Flag Lapel Pins, Badges of historical value. The Hopping Kangaroo is proud to say, Yes we have every single Nation as a Lapel Flag Pin and more. All Lapel Pins shown on our website are available for immediate delivery. All our Lapel Badges are of High Quality - Measurement: 18.5 x 20.5mm, Butterfly Clutch. Crossed Flag Pins make great "emotional" presents. Hand out Friendship Pins to people you meet on your travels. Celebrate and embrace your adopted country and your home country by wearing a crossed flag pin. Show solidarity and respect by wearing a Friendship Pin. Call us on (61)3 9703 2071 or 0418 367 815 we are happy to be of service. Staff and Management of The Hopping Kangaroo wishes all our friends, business partners, and all the people from TANZANIA a very joyful National Day. Celebrate in style. Greet your overseas family members, friends and associates by displaying their flag. Buy International Flags for your reception desk, Trade Fairs. Or simply Hire flags for your next convention. Out of respect display the flag at a funeral. Novelty Flags give you great opportunities to express your mood, your party theme, decorate cubby houses, fill in empty spaces in your garage - cheer on your sport fans, Tennis, Cricket, The Grand Prix Drivers - and many more with their national flag. Hire Flags for your Party, Hire flags on extendable Flag poles for Convention, World Congress or for any Special Occasion. Why buy when you can hire. Are you interested in Historical Flags? Flags can help you to understand the present. Historical Flags teach us about the past. We offer a very substantial range of historical flags. From the oldest flag - Confederate, Rebel USA Flag, Raven Flag, Laos with Elephant flag, Iran Empire Flag, Old South Africa Flag. Previous Flag of Macedonia, Rhodesia, Old Hong Kong Flag, Celtic Nation Flag, Ethiopia flag with Lion, you name it - we have it. If you are interested in History - go to our page "History Talk"
Table flags make a great display in any boardroom where you meet your business partners. Make them feel welcome by displaying their country flag.Flags make a statement and create respect. We do stock over 500 Country Deskflags. International, Novelty, Historical flags. The Hopping Kangaroo supplies flags for all occasions. Hand held flags for parades. Wave the flag of your favourite Tennis Player - show your support with their Country Flag and get noted on the Television. Handwaver Flags are the perfect size to decorate any room. In your School, Church Hall, at a Multicultural office party. We believe in nations pride, most Australians come from far and wide. the Flag can say - this is me, this is my place, and we all get to appreciate the variety of states, cultures and race. 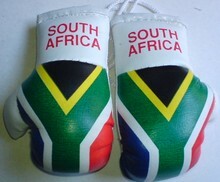 Mini Boxing Gloves - The Hopping Kangaroo has the biggest range of Mini Boxing Gloves to choose from. WE ARE RUNNING OUT OF STORAGE SPACE , STOCK CLEARANCE - CHECKOUT OUR GREAT RANGE AND PRICES. Great Gifts for Birthday's for your work mates or friends and family. HURRY!! The Hopping Kangaroo specialises in World Flags. Internationale Flaggen, Flag Badges, Flag Lapel Pins, Deskflags, Table Flags, Handwaver Flags, Stock Flaggen,Friendship Pins, Crossed Flag Pins,Flag Pins of States and Provinces, Islands, Regions, Counties, International Flag Decals, Mini Car Flags, Mini Boxing gloves, Country Patches. Miniature Flags, Historical Flags. Novelty Flags, Happy Birthday Flags, Messaage Flags, Mini boxing gloves,Why buy a Flag when you can Hire a Flag. Hire Flags only, Hire Indoor Flagpoles, Rent A Flag.